So I had to take a few weeks (a little over a month, really) off from Star Trek. Though I didn't want to believe it, after a year of daily 3-hour supplements, I'd burned out. I took some time to fill a whole new "recently watched" list on Netflix, cleared out my DVR, read several novels, and worked on my next book. Then, over the last few days, a phrase from one of the TNG episodes popped into my head and I couldn't get it out. Mot, the barber. Mot, the barber. Mot, the barber. I couldn't resist. This morning I settled in, spooled up the Netflix, and started Season 6, Episode 18, "Starship Mine." In this one, the Enterprise checks into space dock for a routine baryon sweep and Picard finds himself alone on board with the exception of a group of (not really) terrorists who plan to steal explosive matter from the warp core. I'm not sure why the idea of this episode got stuck in my head but I wasn't disappointed. 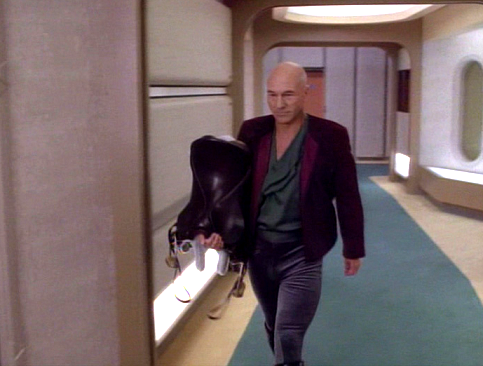 Picard shimmies around jeffries tubes in his boots and v-neck and calls himself Mot the Barber to avoid suspicion while his senior staff contends with terrorists of their own during a party on the space dock's host planet. This is essentially Die Hard in a spaceship. Yippie Ki Yay, Mister Crusher. It's a refreshing change of pace from the typical, "Lets all go to the ready room and calmly decide on a solution to our problems" episode. And maybe that's why it was so accessible for me. Maybe I needed Trek but not Trek. 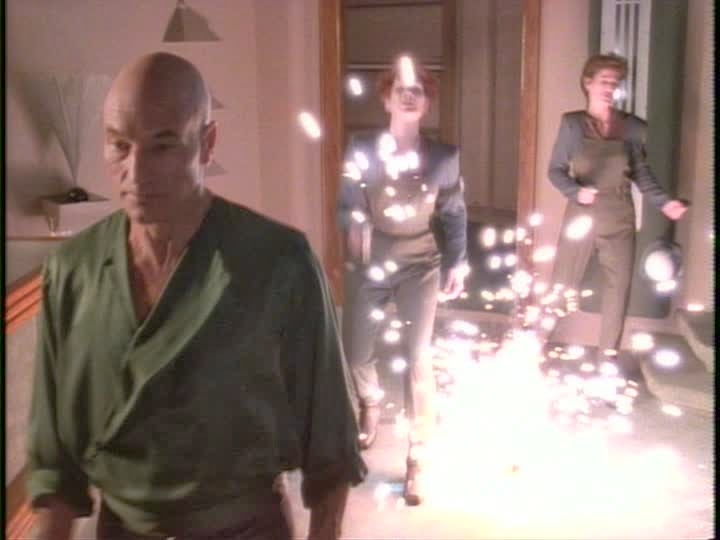 Trek with Picard AND explosions. This one has no caption because cool guys walk calmly away from explosions. Aside from the awesome action, this Starship Mine is excellent for another reason. This late in the series, the stories are executed with the kind of familiarity and ease that only comes with years of working together, writing for and playing the same characters day in and day out. And yet, it doesn't feel tired at all. It feels fresh and interesting and surprising as Picard loads an antique crossbow in his quarters, messes around with a chemistry set, and faces off with Tuvok's apparently secret human half-brother. Do you really think you have a chance against me, Mr. Vulcan? OK, so maybe in the grand scheme of things the ideas in this episode aren't super original. Still, it feels nice to see these guys in action. Actual action. Now I know how a replicated dinner feels. I mean, my favorite episodes of this show are still the slightly more cerebral ones. Darmok, Tapestry, The Chase, Measure of a Man. But sometimes I just need a piece of the action. Picard style. I need to see him, like John Wayne, walk off into the sunset with Grace Kelly. Thanks for answering the questions I've been kicking around- "What am I going watch tonight?" KJ, they ARE velvet! I had the same revelation/reaction. Boots AND velvet riding pants? I don't know why but it's totally working for me. Yes! Definitely watch it! Please, please answer this, even if it's only a YES or NO. Are you guys still doing your X-FILES blog?